Synthetic lubricants for air compressors out-perform petroleum-based lubricants, adding uninterrupted up-time to the life of your air compressors. You can use synthetic lubricants in your rotary screw or rotary vane compressors to provide a median of 8,000 hours of uninterrupted operation at temperatures as high as 195° F while still protecting your compressors from rust and corrosion. Heat is the greatest threat to your air compressors, accelerating the rate of oil oxidation and weakening o-rings and seals. Our synthetic lubricants carry heat away thereby providing maximum protection to sensitive parts, reducing oil consumption, minimizing the buildup of varnish or carbon. Our synthetic lubricants offer you reduced maintenance costs and lubrication consumption, increased energy savings, optimized safety due to higher flash points, and waste reduction as well as protection from heat and wear. 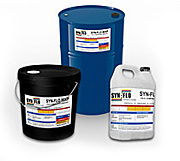 Contact Lewis Systems for synthetic lubricants in Greensboro.